Ever try to find a company name when the ad only gives a phone number? Use a reverse phone directory such as www.ReversePhoneDirectory.com www.BigBook.com, or search on www.Google.com and type in “Reverse phone directory"
Having a strong foundation enables you to build a thriving, profitable life and business. A simple method to create this foundation is with Discovery, Vision, Planning, and Benchmarking, the four cornerstones of your life as well as your business. Discovery is defined as examining where are you now and where are you going. It helps to look at everything as if you were a beginner. Always know why you are in the business of your choice. If your strategy is not clear, you won't recognize the destination when you get there. This is the time to bring in your outside Vision Team. Vision is who you are about and what your life is about. This is where you determine values you need to experience on a continuing basis. Vision is also where you become the expert in your field and decide the purpose of your business. Remember, the smaller the niche, the larger the reward. Abandon any preconceived beliefs you have about this or any other business. They can restrict your thinking. Live out of this new vision, not your past comfort. Planning creates the strategies that help you arrive at your destination. A simple system is to - Show Up, Be on Time, Keep Your Word, and Tell The Truth. It's like riding on that train, sometimes there are hills to climb; sometimes there are curves and other times you're flying rapidly down the mountain to your destination. In any instance, you must remain focused on what you want and where you are going. Benchmarking helps you stay on track without comparisons. This is where you can create goals or optimum wants that may be on the outer edge of possibilities or a goal that is far bigger than you think is attainable. Going into new territory can unlock your potential and increase your development. When goals or optimum results are achieved, you can acknowledge success and learn to be satisfied. Again, put it in writing; the goals, the results and the acknowledgement. Rules require exceptions, so even if you follow the above. And create a strong foundation, you must be prepared for chaos. Chaos can aid in your personal and business development if you have eliminated all toxic people or commitments from your life. Chaos can then become the opportunity to progress rapidly into new territory. You can be the architect of your own life. Build a strong foundation and you can always remodel. Joanne Victoria works with independent professionals and professional practice owners who want to simplify their lives and streamline their operations in order to achieve more. As marketing guru Robert Middleton notes, "People always act in their own self-interest and will respond to marketing appeals that offer solutions to their problems, predicaments, and pains." • They've been asked to apply for a promotion and need a resume. Identify those areas of pain and position your services around them. "Time is more valuable than money -- because money comes from time." That is particularly true for resume writers. A lot of resume writers I know underestimate our ability to manage our time. We think it will take us 2 hours to write the resume ... but it takes us three. We think we can keep up with our billing and administrative details while writing 3 resumes... but we can't. What kinds of things are keeping you from achieving what you want? Procrastination? Disorganization? Getting bored? Frequent interruptions? Dr. Wetmore also said, "Time management is not doing the wrong things faster -- it's doing the right things." If you work from home, you know how challenging it can be. We work 15% more hours in a day than we did 10 years ago. In a home office environment, it can be 20-25% or more. I know that sometimes I go down to my home office in the basement to do "just one thing" and four hours later, my husband comes looking for me. Another interesting comment Dr. Wetmore made was, "There is very little correlation between the quantity of time we sepnd and what we get as an output." Those who make billions of dollars aren't "billions of times smarter" than the rest of us ... they just use their time differently. Budget some self-improvement time for yourself -- most everything you know today will be obsolete in five years. I'm fascinated by technology ... although I don't often understand it. I'm on LinkedIn, but after attending Jason Alba's presentation last week, I understand that I'm not using it as effectively as I can. I also like web portfolios, although I can't create those. And I love websites (my special expertise is in registering domain names, apparently) ... but my husband is the one with the technical knowledge to build and update them. So when it comes to wikis, I'm a novice. My limited expertise in this area is that I know about Wikipedia, and the controversy that erupted after some people edited pages in ways that they probably shouldn't have. So when Laura DeCarlo, of Career Directors International, told me about the CareerWorldWiki, I thought I'd better check it out. Defined, a wiki is "A website or similar online resource which allows users to add and edit content collectively." The beauty of a wiki is that the more people that contribute their knowledge, the better the resource it becomes. The bad thing is: You need people to contribute their expertise. From what Laura told me, the CareerWorldWiki is in its starting phases. But it's not limited to Career Directors members! Any careers industry professional can contribute their knowledge to try to crate what DeCarlo describes as "a one-source compendium of information for both job seekrs and career professions on numerous career service/career process topics." Check it out -- and consider contributing your expertise. You can then link to that content you created from your own website -- building your credibility! I'd love to come back in a month and see that the contributions have doubled ... or tripled. Are you up to the challenge? Will you wiki with me? I love attending careers industry professional conferences. I've been to more than a half-dozen over the years, and always came away with lots of great information. Whether you're new to the profession, or are a long-time resume writer, conferences provide networking opportunities, the chance to get away for a few days, and lots and lots of great ideas and techniques from the industry's biggest names. 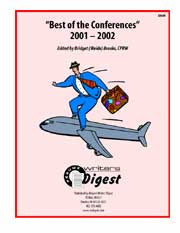 One of the things the print version of Resume Writers' Digest was known for was our great conference coverage. From 2000-2005, we provided recaps (often with photos and handouts) from the conferences of the Professional Association of Resume Writers and Career Coaches (they discontinued holding an annual conference a few years ago), the National Resume Writers' Association, Career Masters Institute (now Career Management Alliance), and the Professional Resume Writing and Research Association (now Career Directors International). As I read through some of these back issues, I realized how valuable this information is -- so I re-edited and re-designed the information into what will be two special reports. The first one -- available now -- is a 60+-page special report, "Best of the Conferences: 2000-2002." It includes the 2000 PARW Conference in Toronto, the 2001 NRWA Conference in San Antonio, the 2001 PARW Conference in St. Petersburg, Florida, the 2002 PRWRA Conference in Atlanta, the 2002 CMI Conference in San Diego, and two careers-related sessions from the 2002 AJST Conference in Orlando. The second special report (release date TBA) will include 2003-2005 conference coverage. You can download the 2000-2002 Special Report from www.tinyurl.com/2so87a and it will be delivered to you for immediate download as an Adobe Acrobat PDF. To give you an idea of how valuable this information is, I've prepared a "Best of the Conferences" Preview newsletter, which you can download for free. It's sponsored by the National Resume Writers' Association and Career Directors International. Speaking of the NRWA, you have less than a week to take advantage of the special early-bird pricing for the 11th Annual NRWA Conference, scheduled for Sept. 24-27, 2008 in San Diego. Until March 31, registration is just $325 (or available in three payments of $112). After April 1, the cost is $385 (or two payments of $198). Visit www.thenrwa.com for details. Pearl White, CPRW, JCTC, CEIP, of A 1st Impression Resume & Career Coaching Services recently e-mailed me to let me know that five of her resume submissions have been accepted for the upcoming book, "Expert Resumes for Engineering Professionals." Pearl also has recently relaunched her website, using Network Solutions. She notes that Network Solutions will design a website for you for $500 or you can do it yourself on their website for free. They'll host it, provide the domain name, and 24/7 customer service for $10/month. Pearl says, "It's a great option for resume writers/career coaches on a budget and a terrific educational experience." I haven't had a chance to read the book, but I am enjoying the blog of the author of "Guerrilla Marketing for Job Hunters." David Perry's blog is a nice mix of ideas and information. I particularly enjoy the bonus tactics he offers. Read this post about "Your Tribe" as one example. I hadn't thought about networking with commercial real estate brokers before, but he's right -- they're some of the most connected people around. Resumes generally are impulse purchases, which is why the Yellow Pages can be an effective tool for capturing new clients. Think about most of your new clients. Chances are, it was a specific trigger that led them to seek out your services. Maybe it was a layoff or merger. Perhaps he or she got a new boss. For college students, it's the impending graduation date. A spouse's relocation is not an unusual motivator. Being in the right place at the right time can help you win new clients. This guest article is by David Dinsmore, founder of Certified Business Appraisal in Morrow, Ohio. David was quoted in the Inc. Magazine article I wrote about in my post earlier this week. If you'd like more information on moving your business towards this model, read the "E-Myth Revisited." After interacting with business owners over the years, we have learned with absolute clarity that your goal as a business owner should be to design a company that is distinct from you and quite candidly, works in your absence. You should create a separate cash flow entity, not merely a job for yourself. It should pay you a healthy salary plus a return on your investment of money, time and effort. You should build equity! You should build wealth! Bottom line, your role should be to shape, manage and grow this independent and enduring asset � your business. Your enterprise should function without you, not because of you. I know this sounds bizarre, but hear me out. While you can be the brains behind the enterprise, you should not be like Hercules trying to hold up the entire weight of the company! You will be crushed! Your business should work harder so you don't have to. You should be able to make money everyday without having to work everyday. You should invest more brain equity and leadership equity and much less sweat equity into your company. Your business should be a product of your brain, not your brawn. You should strive to build a business that does not enslave you and does not rely on your being present every minute of every day doing all the thinking, deciding, worrying, and working. You must adopt a new way of thinking and acting. You must become a strategic business owner. Specifically, you must learn to adopt a CEO mindset; systematize and document your business; lead more and work less; create a simple business plan; utilize the leverage of marketing; effectively manage your greatest asset, your people; and learn to let go. In short, you must transform the way you see yourself and your business. As a strategic business owner, your primary aim should be to develop a self-managing and systems-oriented business that still runs consistently, predictably, smoothly, and profitably while you are not there. You should shape and own the business system (again, an integrated web of processes) and employ competent and caring employees to operate the system. You should document the work of your business so that you can effectively train others to execute the work. You must make yourself replaceable in the technical trenches of your business. To repeat, define and document the specific work to be done and then train and delegate. This is how you begin successfully to beat the blues, escape death by details, and gain greater freedom. With a documented operating system, your employees should be able to carry on the work of the business while you focus on big picture priorities or God forbid, decide to take a break. You should be able to escape the daily drudgery. In fact, your company should run on autopilot status even while you're on an extended, work-free, guilt-free vacation. If it does, you will have designed and built a business that truly works and is worth a fortune. More importantly, in the process, you will have gained back a personal life that is fulfilling. Step one: learn to work on yourself by transitioning to a new way of thinking and behaving. Re-program yourself and your habits. Stop acting like an employee and start thinking like a CEO. Learn to work on your business, not in your business. Adopt the theory of optimization. Be strategic, not tactical; work less, lead more! Step two: systematize your company by creating, documenting and continually improving all your key processes, procedures and policies. Trust the business system and personnel you put in place and remove yourself from the company's daily details. Be more hands-off and more brains-on. Replace yourself with other people. Define and document the work to be done. Train others and delegate the work. This operating system is your foundation for freedom. Step three: increase your leadership capabilities. Excel at leadership, not doer-ship. Your business needs a clear vision and strong leader to hold others accountable, not another employee doing technical work. Help build and direct your team. Step four: develop clarity of direction for your business and employees by creating a simple business plan and an effective implementation process. Step five: learn to effectively manage your people, your greatest asset. Step six: instead of incremental growth, engage the leverage of marketing to achieve substantial, profitable growth. Step seven: learn to let go, delegate, and truly enjoy business ownership, your relationships, and your life. By working less in your business, you gain more time to work on your business and make those essential changes necessary to optimize your company and your life. You may well be skeptical. That's normal. However, let me ask you "Are your current paths and strategies working"? If so, you wouldn't be searching for answers here. If not, I invite you to acknowledge the problems in your business, take responsibility for them, and dare to try new approaches. Follow the advice in this article from Tim Shepelak and your company's market value will consistently grow. You will also build compelling evidence for that value growth to show prospective buyers why. I've written before about closing your business, but a recent e-mail campaign (with the dozens of bounced e-mails) has brought this issue to my attention again. I usually try to find a new e-mail address for the ones that are bounced back to me -- and it's easier if the e-mail address includes the company domain name -- like info@yourresumesite.com. But even then, I've got a list of more than 100 domains that no longer exist. That can be valuable real estate -- I'm half-tempted to go out and register them myself. After all, some resume writer out there spent a lot of time building up that brand name ... only to let it lapse if they left the business. Does anyone know a business broker that does any work in the careers industry? I'd like to interview him or her for a future article -- and I think I could send some business their way. In the March 2008 issue of Inc. Magazine, the "Ask Inc." column featured a question from a business owner who would like to sell the company in the next 18 months. "What is the business without me? Most of your company's value is in your relationships with clients and the knowledge you have gained from experience." Update any manuals you've written or materials you've created to make the business transition smooth -- to help a buyer understand the business -- it can't just be all in your head. If you're selling the business (and not just your client list or domain), make sure you have solid sales record documentation in place. Your client list is your biggest asset. Ideally, you've been keeping in contact with your clients, so the information is still "fresh." The ultimate value of your client list to a prospective buyer is how many of those clients he or she can convert/retain. If you help make the transition possible, your client list will be worth more. I've been mailing to my non-Vertical Response e-mail list this week, trying to drum up respondents for my two open surveys (Conference Attendance and Subcontracting). Along the way, I get a fair number of e-mails back from autoresponders. You know, the ones that usually say, "Hi! I will be out of the office until Monday, March 24. I will respond to your message when I return to the office." Sometimes they'll have a sales message. Like: "I'm sorry I am unavailable to respond to your message at this time. If you are interested in learning more about our services, please visit our website, www.yourresumesite.com." I doubt that you can afford me. If you are still interested in this subject, please call. Wow. I'm not sure what to make of that. Either she is *really* prequalifying customers, or she doesn't want the business. I'll have to follow up with her (when she's back in the office, of course), and see which is the case. You have until March 31, 2008 to take advantage of $60 savings on your registration for the National Resume Writers' Association 11th Annual Conference. It will be held Sept. 24-27, 2008 in San Diego, California. Early Bird Registration is just $325. Wait until April 1 or later and the price is $385. For more information, visit www.TheNRWA.com. The conference will feature sessions on website marketing, interviewing clients, assessment tools, minority job seekers, client agreements and more. On a related note, I'm still looking for careers industry professionals to take my brief survey on conference attendance. Be sure to sign up for the Resume Writers' Digest mailing list (use form in the top right-hand corner of the blog) to be notified of future surveys. You can also receive our FREE "Best Of" Conference Preview newsletter (12 pages). Ever have one of those clients that just couldn't remember when she worked for her employers? Have her go to the local social security office and get dates of employment by using her social security number. The listing is somewhat hard to figure out, but it does list all the employers and dates of employment as well as wages/salary paid to that person. The document is confidential -- that's why your client has to go in person to request it. Thanks to Camille Carboneau for this tip! Thanks to John Donovan, of CRS Resume Service, for bringing this issue to our attention. Mike Farr is an career industry author who has written more than 20 books. He is also the founder of JIST Publishing. CareerOINK is a division of JIST Publishing, which is probably best known by resume writers for their "Gallery of Best Resumes" books. The "Gallery" series, published by David F. Noble, contains compilations of the work of professional resume writers. "While most books are based on one person's opinion of what makes a good resume, Gallery of Best Resumes includes resumes written by dozens of professional resume writers. These people make their living helping others produce good resumes, and they sent us their best work." On CareerOINK, Farr offers "Mike Farr's Online Get a Job Workshop." It's okay to look at other resumes for ideas, but write your own yourself. It will force you to organize your thoughts and background. "This book features resumes from writers who share several important qualities: Good listening skills, a sense of what details are appropriate for a particular resume, and flexibility in selecting and arranging the resume's sections. By "hearing between" a client's statements, the perceptive resume writer can detect what kind of job the client really wants. The writer then chooses the information that will best represent the client for the job being sought. Finally, the writer decides on the best arrangement of the information, often from the most important the least important, for that job." He then provided contact information for the major professional associations. It's understandable that Michael Farr wants people to write their own resumes -- of course, with the help of the books that JIST publishes. But encouraging professional resume writers to submit their best work and then writing on his CareerOINK site that resume writers are just "designers" (even if he wrote something different in the foreword of the "Gallery" book) makes me wonder if the professional resume writing community should be helping him make more money. As a professional resume writer and editor of a trade newsletter for professional resume writers, I am disappointed in Michael Farr's suggestion that people write their own resume -- without providing a caveat that for individuals who have a difficult time communicating what it is they do (or their accomplishments) that professional assistance is available for more than just "design and printing." Get professional help with design and printing if necessary. Many resume writers and print shops have desktop publishing services and can do design for you. The professional resume writing community is not a group of desktop publishers. Our skills combine expert writing, marketing, public relations, and design capabilities ... which, from evaluating thousands of resumes myself over the years, most members of the public do not possess. Most professional resume writers will involve the client heavily in the development process, asking them tough questions about their skills, abilities, and achievements. We welcome individuals to assess their strengths and gather information for their resume development -- but I find that most individuals are not prepared to objectively assess their qualifications in the way that is most relevant for the hiring manager reading the resume. Mr. Farr's comments are akin to suggesting that everyone prepare their own taxes, or represent themselves in court, without taking into account that sometimes handling things yourself can be a mistake. Reading a book on tax preparation can be useful, but it won't necessarily make me ready to complete my 1040 and supporting schedules. Just because I watch Law & Order doesn't prepare me to defend myself in a civil trial. I understand that Mr. Farr is the author of numerous self-help career-oriented books (I've reviewed several of them in our publication), but he is doing a disservice to his readers (and the professional resume writers that contribute to many of JIST's books) by not educating them about the availability of professionals to help them with this aspect of their job search -- and not just helping them "design" a resume they write themselves. Previously, I have offered JIST books for sale to our readers -- and have encouraged resume writers to contribute their work to JIST-published books, such as "Gallery of Best Resumes"; however, I will be revisiting this in light of this statement on a JIST-owned website, unless Mr. Farr modifies these guidelines. Resume writers -- what do you think?? They come in waves -- the clients seeking a pharmaceutical sales job. A lot of them pop up in the spring ... like flowers. Or weeds. I'm not sure which. from, they claim they are "the leading career center for professionals in this industry." I don't know that I can recommend all the resources in their "Books" section, but at least it's a place for your client to start. Here's another resource: "Cracking the Code to Pharmaceutical Sales" by Teena Rose. If you're interested in entering the competitive world of pharmaceutical sales, the book offers resume samples, sample interview questions, and interviews with recruiters and employees in the industry. Thanks to Jill Walser of "I Got the Job" in Bellevue, Washington, for pointing out state-specific resources providing labor market and economic analysis. Jill's blog post on Workforce Explorer (see 2/12/08 post), the state of Washington's site for detailed local economic information, got me thinking about whether other states have similar resources. A Google search for "labor market and economic analysis" and "Nebraska" returned the Nebraska Department of Workforce Development's site, which provides "Labor Market Information," including a state-specific unemployment rate analysis, and Nebraska's "Explorer" site. Total all occupations working in Nebraska Statewide can expect to earn a median cash salary of $27,180 or $13.05 per hour. The median wage is the 50th percentile wage estimate--50 percent of workers earn less than the median and 50 percent of workers earn more. Half of the people in this job earn between $19,205 ($9.25 per hour) and $41,525 ($19.95 per hour)(i.e., between the 25th and 75th percentiles). An entry level worker can expect to earn $16,910 ($8.15 per hour) while an experienced worker can expect to earn $42,355 ($20.35 per hour). This is the kind of information you can use in a news release, marketing materials, and client educational communications. See if your state has something similar!! A few months ago, I wrote about a presentation that Phyllis Shabad gave on developing career portfolios at the National Resume Writers' Association conference in 1999 in New Orleans that I think was the best information I've ever heard on the subject. She called a career portfolio a "secret marketing tool" that will allow you to control 50% of questions in an interview. How do you create the portfolio? Start with a 1" binder, page protectors, and section dividers. It should include no more than 25-30 pages of documentation. Create themes for no more than five main sections. Organize the information. Make copies -- don't include any originals. Put two copies of each item in the page protector, so you can give one copy to the interviewer. A few months ago, I blogged about "Free Resume Samples On Your Website-Yes or No." My feelings on the subject are "generally, yes." To take this idea a bit further, a while back, many of us in the careers industry received a solicitation from a website looking for resume samples -- FreeResumeExamples.net. The pitch was that we'd be able to expose our work to prospective clients, at no charge to us. Their business model was simple -- attract visitors to their site by offering them free resume samples, and make money off the traffic by cashing in on Google ads. Wanting to know if this was a solid lead generation idea for professional resume writers, I e-mailed a couple of colleagues whose work is featured on the site. "I'll market myself anywhere if it's free," says Greg Faherty, CPRW, of A Perfect Resume. "Every bit of exposure helps. Unfortunately, I don't have exact numbers for how many people actually ordered resumes from me after seeing the resume samples posted there -- maybe five or six?" It was Greg's Military Conversion resume sample that caught my attention -- according to FreeResumeExamples.net, that resume has registered more than 1,000 views since being added in August 2007. Considering Greg pays nothing for the exposure, generating 5-6 sales (at an average fee of $200) is an extra $1,000. Not bad. Another satisfied participant is Courtney Pike, with JobBound. "We have received a significant amount of traffic on jobbound.com due to FreeResumeExamples.net. We track our clients and sales, and many customers have found JobBound through Internet searches," Pike noted. "We think JobBound's work speaks for itself, so we saw this site as a great venue to showcase our expertise." Pike said they would "do it again" as the partnership has improved their web site statistics. Another resume writer, Margaret Burkholder, of Advantage Writing in Tucson, hasn't had much luck with the site. "I have not gotten any business from the site. All of my business has been generated locally from personal efforts, the Yellow Pages, and 'word of mouth,'" she notes. "I received an email soliciting resume samples and I responded, thinking I'd have nothing to lose and only something to gain." Baseball season is coming up, and it reminds me of a presentation that Robert Middleton, of Action Plan Marketing, made at the 2002 National Resume Writers' Association conference. Robert had a client acquisition strategy he called "Marketing Ball." He said you need to have a system to get consistent, powerful results with your marketing. One of the things that struck me most in his presentation was that "If you try to hit a home run, you'll strike out." Instead, you need to make base hits. First, you need to say "the thing" that gets prospects saying, "That's interesting. Tell me more." Middleton said, if you get that, you get to first base. Next, you try to get to second base. The way to get there is to give people more information. To get to third base is the sales process. It's capturing their interest and having them want to move forward. Middleton said the hardest part for independent professionals -- like resume writers -- is getting to second base. As resume writers, we try to hit home runs -- like getting a client to agree to a $1,000+ project (resume, cover letter, bio, branding work) without doing the work of base hits. Remember that on Opening Day. Of particular use is the worksheet to estimate costs to attend -- and then some suggestions for improving ROI. How do you correctly apply personal branding to two of the hottest online networks (LinkedIn and Facebook)? This teleseminar -- scheduled for Thursday, March 13, 2008 at Noon Eastern time -- will give you the information you need to get up to speed quickly. The one-hour teleseminar will be lead by William Arruda, founder of Reach, the leading global personal branding organization. The presenter will be Jason Alba, author of "I'm on LinkedIn- Now What?" He also co-authored "I'm on Facebook-Now What" and is CEO of JibberJobber.com. There is no cost to attend -- but enrollment is limited to the first 200 participants. Register here. I came across an article on author Malcolm Gladwell ("Blink" and "The Tipping Point") that led me to his online archive of articles from The New Yorker magazine. There I found an interesting article on employment testing -- specifically, the role of the personality test in the selection process. Personality testing is a $400 million-a-year industry, and there are more than 2500 kinds of tests out there. We have a personality in the sense that we have a consistent pattern of behavior. But that pattern is complex and that personality is contingent: it represents an interaction between our internal disposition and tendencies and the situations that we find ourselves in. Gladwell's articles are often quite lengthy, but worth the read. I'd recommend this one in particular. The resume writers and career coaches I know are extremely ethical and reputable, but as our fees rise (as they should!) we have to be careful not to be lumped into the ranks with the Bernard Haldane firms of the world. Prominently featured on Nick Corcodilos "Ask the Headhunter" website is the story of "Executive Career Counselors, Inc.", a fictionalized name for a real firm ... not a professional resume writing firm, mind you, but one of those firms that promises "access to the hidden job market." I urge you to read it carefully -- and consider the promises we make to our clients. We are ethically bound not to overpromise -- and we must ensure that they take an active role in their own job search, lest they spread the word about you and your firm. "Mr. CFO" is complicit in his own misfortune too -- he claims he knew better than to "spam" HR personnel, but admits he sent out over 6,000 resumes through his affiliation with "ECC." They did have some useful ideas for him -- joining professional associations and attending industry conferences -- but he was reluctant to throw good money after bad. He'd spend $10,000 on the EEC services, but not $1,200 to get face-to-face with peers in his industry who know of job openings (by attending conferences). It's a cautionary tale -- not just for job searchers but for the careers industry. We are lumped in with these firms and the myth is perpetuated that anyone who you pay to help you with your job search is out to rip you off. Even when the company name is fictionalized, stories like this give us all a bad name. Yes, I know it's Friday. But I got my days mixed up because my hockey team played yesterday (Thursday) instead of today (Friday). So I sent out my new "Thursday survey" on professional association conferences today. I will report the results on the blog. Having built many successful business relationships with customers, I suddenly find myself experiencing call reluctance. I've lost all confidence in my ability to create the win-win scenario. How can I get my confidence back? Does that sound familiar? Do you ever find yourself dreading answering the phone, because you just "know" there's going to be a price shopper on the other end? Or worse, it will be a good prospect, but you won't be able to "close" the sale? First of all, realize that everyone "is prone to slumps." He says that "sometimes you have to understand why you've lost something before you can get it back." Was it a particular client that shook your confidence? Was it a series of calls that just didn't seem to go your way? Or is something going on in your personal life that is affecting your business? Just thinking about these issues might be enough to get you back on track. Maybe you'd benefit from writing out a call script to help guide the conversation. Or maybe you need "a mentor whose confidence is contagious," as Dr. Sulkowicz put sit. In a landmark study evaluating the impact of environmental conditions on productivity, Cornell University ergonomics professor Alan Hedge found a 74% increase in typing mistakes and a 46% reduction in typing output when office temperatures fell from 77 degrees (Fahrenheit) to 68 degrees. Hedge says, "This study shows that when employees get chilly, at least in this case, they are not working to their full potential." -- From a news release from Onset Computer Corporation, as reported in Fast Company magazine (1/05). Another celebrity has been caught using an embellished resume -- and this is a publicity opportunity for you! Job searchers can learn from the misfortunes of Robert Irvine, a British-born chef and presenter of Dinner: Impossible on the Food Network. Claiming credentials you don't have is a recipe for disaster, says [YOUR NAME], a professional resume writer. "Job seekers are most likely to lie about things like their education or number of years they worked for a company -- and these are the easiest things to check," says [YOUR LAST NAME]. "If you're not caught when the company checks your references, you will likely get tripped up somewhere along the line. And many companies have a policy to fire employees caught lying on their applications -- even if that's several years later." Lying on resumes is on the rise. An online survey conducted for the Society for Human Resource Management (SHRM) found that more than 60% of the 373 human resources professionals who responded reported finding inaccuracies on the resumes they review. Inaccuracies aren't necessarily lies, but anything that brings the job seeker's character into question is likely to end his or her chances for getting the job. Irvine admitted that he lied about being a Knight Commander of the Royal Victorian Order and exaggerated his role as a traveling chef for numerous heads of state. "If the issue is the job searcher's insecurity about his or her qualifications for the position, there are ways to address the issue without lying," says [YOUR LAST NAME]. "It's just not worth the risk when there are perfectly legitimate ways to position your credentials -- for example, your lack of a degree -- and still win the interview." Note to resume writers: If you use this news release, be sure to customize it. And be sure to include a phone number where you can be easily reached -- and monitor your calls. The biggest response to a story like this will come in the next 72 hours. I am working on updating the compiled list of subcontract opportunities in the "Making Money as a Resume Subcontractor" special report. If you are an individual or firm that hires subcontract writers and want your listing included in the report, please e-mail me (rwdigest@aol.com). Well, I'm updating the Resume Writers' Digest database again, and my search for some of the careers professionals that have moved or left the business continues. Along the way, I have come across some interesting things -- like a couple of associations for resume writers and career professionals which -- according to my research -- simply don't exist. Yet they issue membership certificates and apparently award a "Certified Professional Resume Writer" credential. A search for "National Association of Career Professionals" on Google came up empty. Likewise, a search for the "International Association of Professional Resume Writers" turned up no matches. You'll find all of those associations using Google.